JCI PRESENTER OFFICIAL COURSE is the first step to become JCI Head Trainer thus being able to conduct to JCI members the official JCI Courses and becoming better in your business and personal life. It is a course in which you will learn all the methods of Presentation and how to improve your Presentation Skills by the aid of JCI Action material. JCI Effective Presentation Course is a full day course that focuses on the concepts of creating and delivering an effective presentation utilizing visual aids and strong delivery methods with a mind towards understanding the audience. Participants practice presentations during the entire course. It is a Full Day Course of 7 modules (theoretical & practical) starting from 9 a.m. until 7 p.m. Attendants must attend all modules in order to graduate successfully and get the certificate of the course. Lecture: What type of Leader are you? Το Διεθνές Επιμελητήριο Νέων Λεμεσού προσκαλεί τα μέλη του στο Εκπαιδευτικό Σεμινάριο/Εργαστήρι με θέμα «Μάθε τι είδους ηγέτης είσαι!! !» που διοργανώνει το Σάββατο, 28/05/2011 η ώρα (10:30 π.μ. – 1:30 μ.μ.) στο Εμπορικό και Βιομηχανικό Επιμελητήριο Λεμεσού (ΕΒΕΛ). Κύριος εκπαιδευτής θα είναι ο κ. Ευαγόρας Κασινίδης. Η εκδήλωση είναι αποκλειστικά για τα εγγεγραμμένα μέλη του Διεθνούς Επιμελητηρίου Νέων Κύπρου. 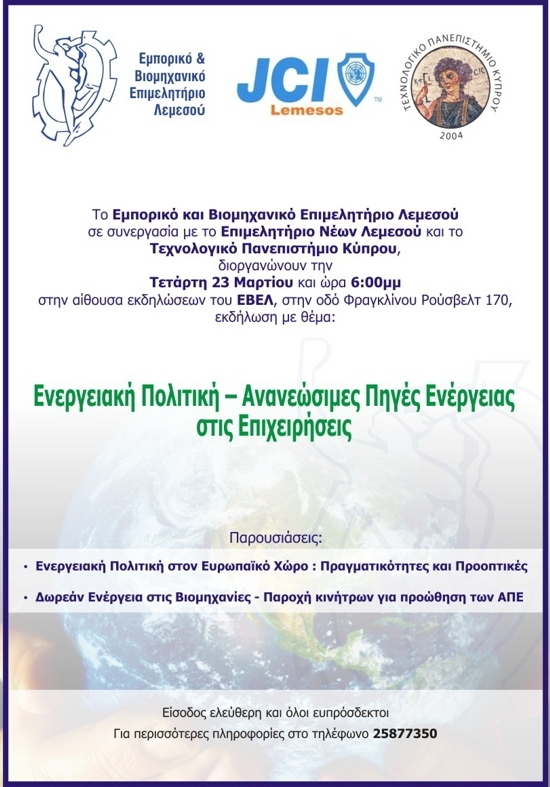 09 JUL 2010 – President Mr. Andreas Christophides attends EBE Pafos (Pafos Chamber of Commerce & Industry) General Assembly. 20 APR 2010 – President Mr. Andreas Christophides attends ΕΒΕΛ* monthly meeting. 16 MAR 2010 – President Mr. Andreas Christophides attends ΕΒΕΛ* monthly meeting. 18 FEB 2010 – President Mr. Andreas Christophides attends ΕΒΕΛ* monthly meeting. 19 JAN 2010 – President Mr. Andreas Christophides attends ΕΒΕΛ* monthly meeting. 13 JAN 2010 – 1st LOM meeting. Cut fo the traditional cake. 15 DEC 2009 – President Mr. Andreas Christophophides & VP Mr. Andreas Hadjipanayis attend ΕΒΕΛ* monthly meeting. 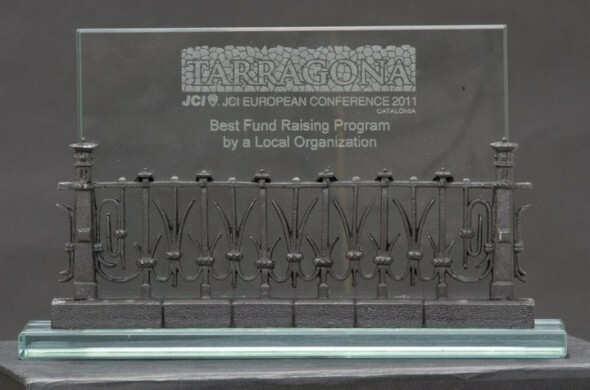 11 DEC 2009 – JCI Lemesos Christmas Gala Dinner. 13 OCT 2009 – President Mr. Evagoras Kasinides attends ΕΒΕΛ* monthly meeting. 8 SEP 2009 – President Mr. Evagoras Kasinides attends ΕΒΕΛ* monthly meeting. 27 JUN 2009 – JCI Lemesos Board dinner in honor of JCI Trainers Mr. Filipe Carrera and Ms. Mayss Al Zoupi. 24 JUN 2009 – President Mr. Evagoras Kasinides attends the Annual General Assembly of ΕΒΕΛ*. 9 JUN 2009 – President Mr. Evagoras Kasinides attends ΕΒΕΛ* monthly meeting. 8-14 JUN 2009 – Members attend the JCI European Conference in Budapest. 12 MAY 2009 – President Mr. Evagoras Kasinides attends ΕΒΕΛ* monthly meeting. 7 APR 2009 – President Mr. Evagoras Kasinides attends ΕΒΕΛ* monthly meeting. 30 MAR 2009 – Lecture event with title “Grant Opportunities from EU and the Cyprus Government”. Speaker Dr. Alexandros Michaelides. 28 MAR 2009 – JCI Europe VP Mrs. Konstantina Sakellariou visits JCI Lemesos. 15 MAR 2009 – Recruiting committee meeting with new members at Kourium Palace Hotel. 10 MAR 2009 – President Mr. Evagoras Kasinides attends ΕΒΕΛ* monthly meeting. 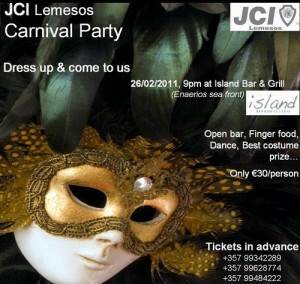 28 FEB 2009 – The JCI Lemesos annual Carnival Party is held with great success. 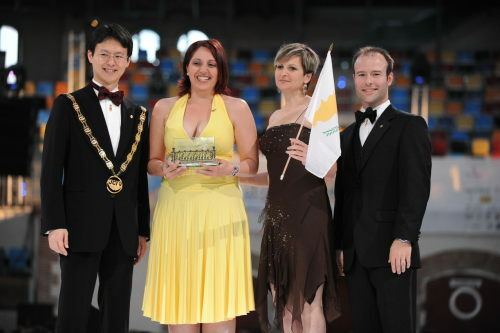 19 FEB 2009 – JCI Lemesos Past President and General Secretary Mrs. Mary Stephanidou attends the European Presidents meeting in Portugal. 10 FEB 2009 – President Mr. Evagoras Kasinides attends ΕΒΕΛ* monthly meeting. 28 JAN 2009 – Lecture event with title “The Current Economic Crisis and Cyprus”. Speaker Dr. Stelios Platis. 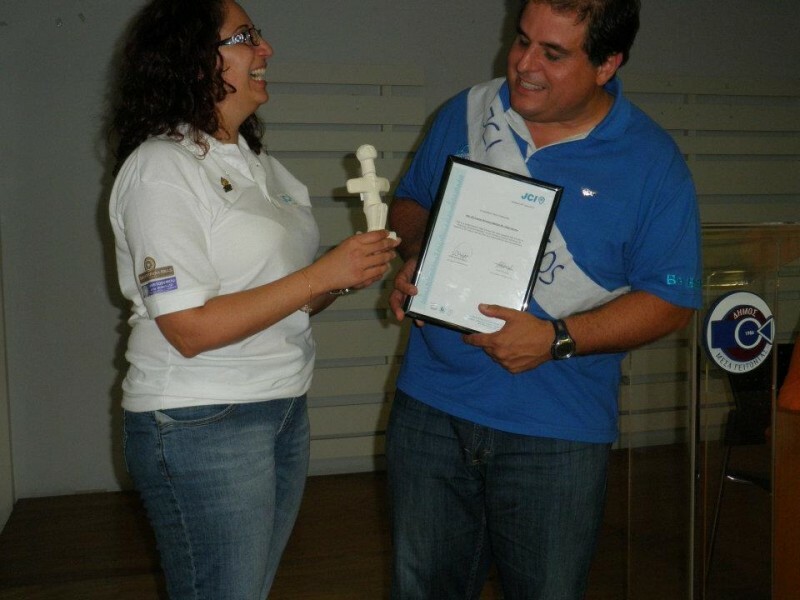 17-18 JAN 2009 – President Mr. Evagoras Kasinides, Vice President Mrs. Katia Stephanidou and LOM General Secretary/NOM Vice President Mrs. Mary Stephanidou attend JCI Cyprus orientation weekend organized by JCI Cyprus. 13 JAN 2009 – President Mr. Evagoras Kasinides attends ΕΒΕΛ* monthly meeting. 9 JAN 2009 – 1st LOM meeting. Cut fo the traditional cake. 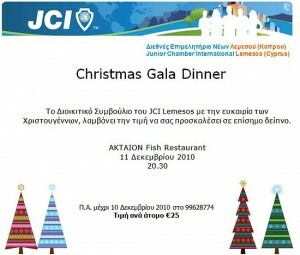 12 DEC 2008 – JCI Lemesos organized Christmas Gala Dinner of 2008. 09 DEC 2008 – President Mrs. Mary Stephanidou attends ΕΒΕΛ* monthly meeting. 11 NOV 2008 – President Mrs. Mary Stephanidou attends ΕΒΕΛ* monthly meeting. 30 OCT 2008 – General Assembly of NOM Lemesos. After election the new board of LOM Lemesos for 2009 is formed. 26 OCT 2008 – During LOM meeting the LOM decided to nominate Mr. Alexander Stamatiou for the position of EVP for the 2009 NOM board position and Mrs. Mary Stephanidou for the position of VP for the 2009 NOM board position. On the 27th October fax is sent by LOM president to NOM president of 2008 Mr. Giannis Trochides with the official nominations of the LOM regarding the NOM board for 2009. 14 OCT 2008 – Director Mr. Evagoras Kasinides attends ΕΒΕΛ* monthly meeting. 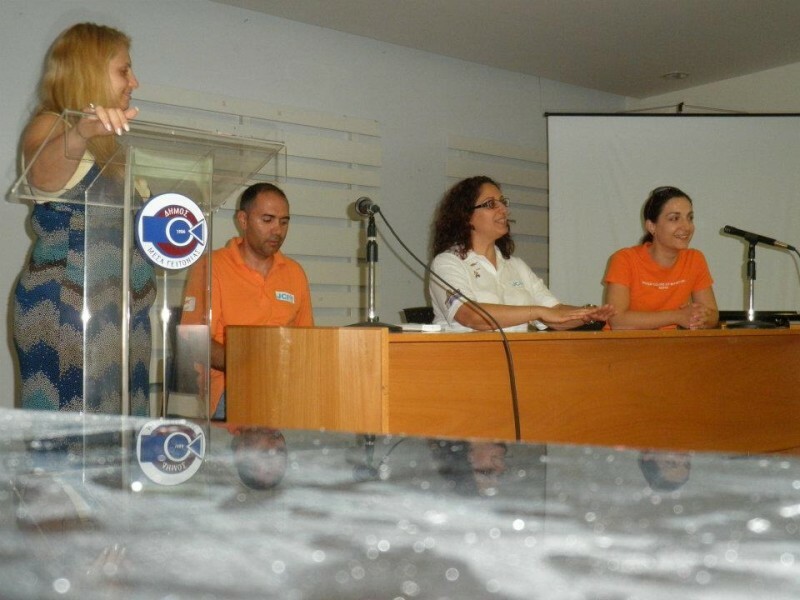 23 SEP 2008 – JCI Lemesos supports the Cyprus Anti-Cancer Society event of “150years of G. Puccini”. Members of JCI Lemesos attend the event. 16 SEP 2008 – President Mrs. Mary Stephanidou and Director Mr. Evagoras Kasinides attends ΕΒΕΛ* monthly meeting. 26 AUG 2008 – President Mrs. Mary Stephanidou attends ΕΒΕΛ* monthly meeting. 20 JUL 2008 – JCI Lemesos organized a Summer get together on Sunday 20th July at the beach bar/restaurant DROPS. 9 JUL 2009 – President Mrs. Mary Stephanidou attends ΕΒΕΛ* General Assembly. 4 JUN 2008 up to 8 JUN 2008 – President Mrs. Mary Stephanidou attends the JCI European Conference 2008 at Turku Finland along with other members from Lemesos and Cyprus. 29 MAR 2008 – International Vice President Mr. Rami Majzoub visits LOM Lemesos. Meeting with the board and discussion of the activities of the LOM was held after dinner at his honor. 01 MAR 2008 – JCI Lemesos & JCI Paphos Carnival 2008 Party for all members held at ‘Waves’ Bar with huge success. 12 FEB 2008 – President Mrs. Mary Stephanidou and Director Mr. Evagoras Kasinides attends ΕΒΕΛ* monthly meeting. 11 FEB 2008 – JCI Lemesos Board meeting. 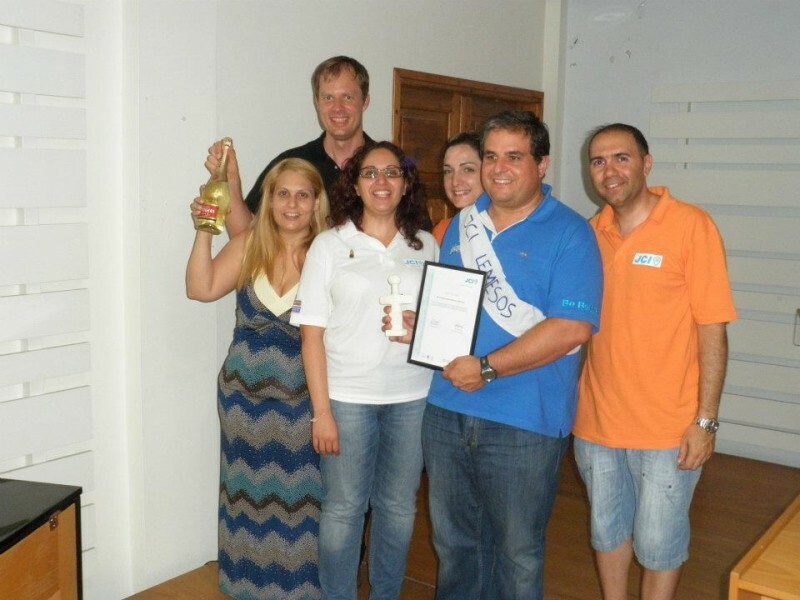 8 FEB 2008 – JCI Lemesos members attend JCI Paphos event. 22 JAN 2008 – JCI Lemesos Meeting. Mr. Christakis Loizides wins the New Year Pie “Lucky Coin”. JCI Cyprus Executive Vice President Mr.Vouvakos attends the meeting. 16 JAN 2008 – JCI Lemesos President Mrs. Mary Stephanidou and Director Mr. Alexander Stamatiou attends the JCI Cyprus General Assembly held at Golden Bay Hotel in Larnaca.Mr. 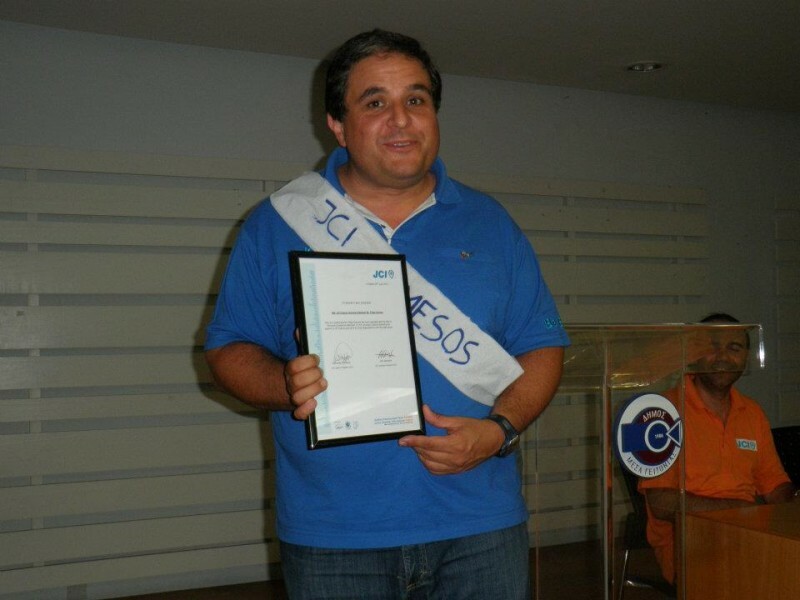 Alexander Stamatiou is elected at the possition of Vice President of JCI Cyprus board. 15 JAN 2008 – President Mrs. Mary Stephanidou attends ΕΒΕΛ* monthly meeting. and Director Mr. Evagoras Kasinides attends ΕΒΕΛ* monthly meeting. 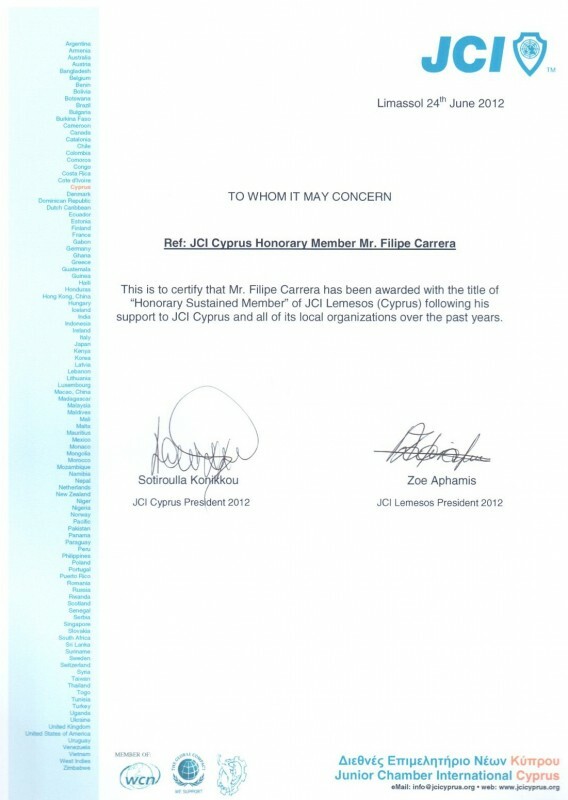 01 DEC 2007 – JCI Lemesos implements its deticated mailing list. 27 NOV 2007 – President Mrs. Mary Stephanidou attends ΕΒΕΛ* monthly meeting. 24 NOV 2007 – JCI Lemesos celebrated its 10th Anniversary with a gala dinner at Elea restaurant where the honored guests, the president of ΕΒΕΛ* Mr. Dimitris Solomonides and all past presidents of JCI Lemesos have been honered with memory plaques by the JCI Lemesos board of 2007. 13 NOV 2007 – GENERAL ASSEMBLY – Board of 2008 elected. It was decided by the assembly that the old board will continue as it is. The president of 2008 Mrs. Mary Stephanidou promotes in the new position of secretary Mr. Andreas Christophides. 30 OCT 2007 – President Mrs. Mary Stephanidou and Director of Sponsorships Mr. Alexander Stamatiou attends ΕΒΕΛ* monthly meeting and presents to the members of the board the plan of corporate sponsors of JCI Lemesos for the year 2008. 10 SEP 2007 – President Mrs. Mary Stephanidou and Director Mr. Evagoras Kasinides attends ΕΒΕΛ* monthly meeting. 31 JUL 2007 – Director Mr. Evagoras Kasinides attends ΕΒΕΛ* monthly meeting. 18 JUL 2007- Upon invitation President Mrs. Mary Stephanidou attends the annual general assembly of ΕΒΕΛ*. During the presentation LOM Lemesos is mentioned for its partnership with ΕΒΕΛ* and exchange of web links is agreed by both organizations in their official web sites. 8 JUL 2007 – Summer Party at Fasouri Watermania Waterpark sponsored by Fasouri Waterpark and New Cytech. 3 JUL 2007 – President Mrs. Mary Stephanidou and Director Mr. Evagoras Kasinides attends ΕΒΕΛ* monthly meeting. 20 JUN 2007 – International Vice President Mrs. Michelle Macdonald in her world tour visits LOM Lemesos. Meeting with the board and discussion of the activities of the LOM was held after lunch in her honor. 12 JUN 2007 – President Mrs. Mary Stephanidou and Director Mr. Evagoras Kasinides attends ΕΒΕΛ* monthly meeting. 15 MAY 2007 – President Mrs. Mary Stephanidou and Director Mr. Evagoras Kasinides attends ΕΒΕΛ* monthly meeting. 19 APR 2007 – Lecture Event to our members with the title “The Role Of Innovation In Small Business And Its Contribution To Their Development” at the cultural center of Bank of Cyprus. 16 APR 2007 – President Mrs. Mary Stephanidou presents to Mr. Alexandros Stamatiou the title of Honorary Sustained Member of JC Lemesos for his contribution to the LOM and his services to the LOMs website. 9 APR 2007 – LOM Lemesos gets its new website, http://www.juniorchamberlemesos.org sponsored by Sky and Earth Global Services. 4 APR 2007 – Dinner held in honor of the President of ΕΒΕΛ* Mr. Demetris Solomonides at Artyma restaurant, hosted by the board members. Official invitation was presented by Mr. Solomonides to the President of LOM Lemesos and one member of its board to attend the monthly board meetings of ΕΒΕΛ*. 3 APR 2007 – Invitation presented to President Mrs. Mary Stephanidou to attend the monthly meeting of the board of ΕΒΕΛ* at their premises. 19 MAR 2007 – JCI Lemesos Carnival 2007 Party for all members held at ‘Centrale’ Club with huge success. 17 FEB 2007 – Obligatory general assembly for the election of the new board after the voluntary resignation of the previous board is held.